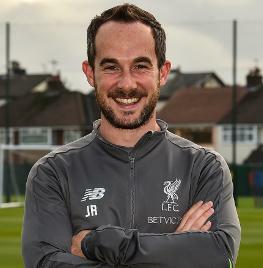 Jack Robinson began his role as Liverpool’s first-team assistant goalkeeping coach in September 2018. Robinson joined the club from the Football Association to take up a new position alongside John Achterberg in the Reds’ backroom set-up. Prior to his two-and-a-half years working with England’s U15-17 stoppers, he had spells with Manchester United, Crystal Palace and Leeds United. “It’s great to be at Liverpool, a club with such a real and rich history of success and winning trophies,” said Robinson, who holds a UEFA A licence in goalkeeping. “Hopefully I can come in and help the club continue to develop on the upward journey it is on. “It was a difficult decision to leave the FA as I enjoyed my experience and time there, working with some great people and players, but an opportunity to work at a big club like this with a successful manager and team was too good to turn down.